This apartment is located in a beautiful villa with a shared swimming pool, with a garden where you can enjoy a good local wine and enjoy the sunset. There are 3 other apartments. They are all equipped with luxurious furnishings well been cared for and there is WIFI throughout the whole villa. 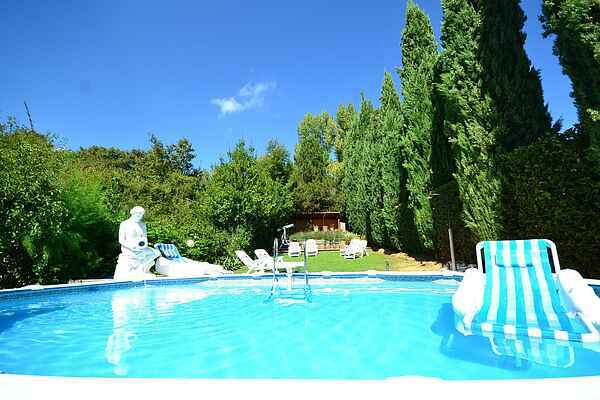 The villa is located in a central area of ​​Tuscany, not too far from the many attractions of the province. Firstly there is Certaldo which is only 2km away, the lovely town is known for its perfectly preserved medieval village. At 40km away are the historic cities of Siena and Florence and at 60km Lucca and Pisa. Known all over the world there is San Gimignano at 12km away. Nearby there is a golf course, a tennis court, a riding school, a cooking school and a fitness facilities. In addition, in Certaldo, you can rent bicycles, scooters and cars. Not far from the historic center there is the "Canonica hill Park" a protected area that preserves the typical Tuscan hills and provides, thanks to picnic areas, the possibility of conducting picnics and barbecues. From the top of the small park you can admire a wonderful panorama that sweeps from the village of Certaldo to the towers of San Gimignano; by vineyards and olive groves to the hills dotted with cypress trees. The sunset, seen from here, it's wonderful! In Certaldo there are weekly public events like food / antique markets or exhibitions; But Certaldo is famous nationwide for "Mercantia" (the street art festival) that takes place in July and "Boccaccesca" (festival of street food) that takes place in October. Many wineries in the area offer guided tours of their vinyards and tasting of their wines. In the vicinity of the town there are many ancient churches and castles, and the original route of the Via Francigena: the path that during the Middle Ages was used by pilgrims to travel from northern Europe to Rome. At just 12 km away is the town of San Gimignano, known for the production of its white wine, Vernaccia, and saffron, but primarily known worldwide for its beautiful medieval towers, and called the Manhattan of the Middle Ages. At 30 km, you have Volterra, jewel of Etruscan, Roman and medieval times. Other cities such as Florence, Siena, Pisa, Lucca and Arezzo are all reachable within an hour drive, and some of them also comfortably by train.